This is the second part of a multi-part post that looks at the new Microsoft Teams for Education with reference to Google Classroom and shows how they can be used in combination. 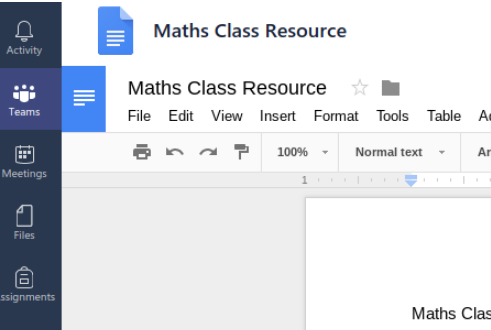 Both Google Classroom and MS Teams can be accessed through a web interface (classroom.google.com and teams.microsoft.com). In addition Teams has a locally installed windows application which looks and acts very much like the web version which is a nice integration. Logging into Teams for the first time displays a similar interface for both the student and the teacher. Google has opted for a ‘chunky’ tile style portal which allows user to easily move in and out each classroom while the Microsoft interface displays each Team as a ‘mini-tile' within an integrated dashboard. Any Microsoft account granted Team access from the Office365 admin portal can create a Team. However an account with the Office 365 A1 for faculty licence is presented with an additional set of templates (below) that customises the Team for classroom use while a student just gets a standard dialog. Not surprisingly the basic unit of organization is the Team which can contain both teacher and student accounts. The meatball icon after the Team name gives you access to all the core management features including the ability to add members and update some Team settings. As you might expect only Teachers get access to the management options. The Add Members option gives you a dialog with a Settings tab. As the Team is already templated for class use you can leave the majority of the settings unchanged with the possible exception of “Only owners can post messages” which mimics the “Only teachers can post or Comment” in Classroom. The Theme section gives you access to a fixed set of icons that you can use to replace the standard tile graphic. These are not customisable at the moment. One advantage of changing the tile graphic is that is shows up in the details dialog in the Office365 group management dashboard which could be useful in identifying the item as a Team rather than a standard group. Adding students to a Team is a simple as picking an account or an existing group from a list. Note: It has to be an Office365 team or a Distribution Group, a security group does not work in this context. The process ‘seeds’ the new Team using the accounts in the group. 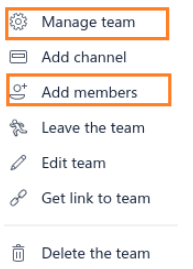 Adding or removing members from the original Office 365 group does not affect Team membership. 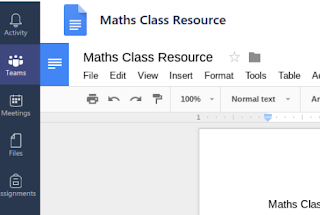 There isn't yet an equivalent of the “Class Code” option that’s available with Google Classroom however for larger implementation you might expect Teams to be linked directly into the school SIS/MIS system for ease of management. Like Classroom there are third party tools that will do this and a free utility provided by Microsoft. When you create a Team this automatically creates a General channel. Channels allow you to keep conversations and workflows focused to specific subject area within the Team . You can dedicate channels to specific topics within the class using the Add Channel menu item. Each channel can host a conversation, a file section and a notebook. The conversation section represents a chat area dedicated to the specific channel and has some interesting properties including an email address which can be accessed from the meatball menu to the right of the channel description. This allows you to post from an external email account right into the stream. This option to display the email address of the stream is also available to the student which is a little surprising since it opens the the door to the possibly of anonymous postings. You can turn this feature off (it’s on by default) from the Office36 Console from Settings - Services and add-ins - Microsoft Teams - Email integration. Any inbound email to the channel address will now be bounced but like everything in the console it’s is a tenant level policy only. Other than the external address the conversation is restricted to the members of the Team in the same way that the chat function in Classroom operates. The conversation can incorporate attachments from other cloud storage accounts including Google Drive and Dropbox which is definitely a nice feature. Also the ability to add giphy, smilies, emojis and stickers certainly adds to the fun factor but may not be appropriate in all circumstances. You can control these functions from the console (for the whole organisation) or at the Team level by accessing the options from the Manage Team - Settings dialog. Outside of the Conversation settings for each Team there is a general Chat facility that allows a student to set up a private message group which can contain any other user within the organisation. It can be accessed through the Chat icon in the left hand menu bar. If this sound like something you’d like to avoid within your school, a control for this can be found in Settings - Services and add-ins - Microsoft Teams, Messaging section in the Office365 admin console (below). If the option is turned off the Chat icon is removed from member sessions but is retained for Team Owners. However like all console setting this option operates at the organizational/tenant level only. The Files sections of a channel provides access to a dedicated SharePoint site related to the topic. A Microsoft Office document saved to this area is available all team members and documents can be opened and worked on collaboratively using the Office Online web tools. Like GSuite the Office Online web tools provide a Chat facility for users actively editing the file and all of this works very well on a Chromebook. With this in mind the option to add Cloud Storage to the storage site provides some intriguing possibilities. The screenshot above shows a GSuite Classroom folder mapped into the File section of a Team Channel allowing you navigate through the folder tree and open and edit a Google Doc (below) in exactly the same way as if you were working with Google Drive - which of course you are because it’s just another web session. Google Drive isn’t the only storage option, you can enable other suppliers for the Team admin section in the console, but the same limitation applies - it’s a organizational level setting. So where does OneDrive fit into all of this? The answer as the storage option for the whole site, working outside of the Channels and any individual Team you might create. OneDrive sits under the File option on the main menu bar and acts as the default personal document store for the student. But if you enable Google Drive it can also join OneDrive on the menu bar pretty much as an equal partner. This all may look a little strange but it works fine. Office Docs in Google Drive open in read only mode but Google docs work as you would expect, or at least it did on my Chromebook. You don’t get to see the Drive artefacts such as Recent, Shared with Me or any of the search features. The option to edit the documents Share details is also disabled but other than that it’s just like any normal GSuite editing session. OneNote has been used as a collaborative tool in MS based schools for a number of years now and has a well established workflow based on a shared workbook principle. Teams doesn’t really add to it’s functionally but simply incorporates it into the framework of a Team channel. In this respect a channel is essentially three elements brought together with a single set of access permissions. Notes: A OneNote notebook with the teacher as the owner stored in Sharepoint. Conversations: A hidden directory in Team storage (Conversation History\Team Chat) which is replicated to an Exchange Group Mailbox for compliance purposes. The power of Teams is that every time a Channel is created all these resources are automatically setup and managed as a unit going forward. The fact that Teams is built on top of Sharepoint is not hidden and indeed the meatball menu provides the option of opening the Team directly in the Sharepoint interface (above) which gives you additional facilities including the ability of importing existing Notebooks into a channel. Another advantage of opening up the Sharepoint interface is that it gives you an insight into how Teams actually work. This is particularly useful when we look at the workflow around Assignments, which is covered in the next post. SSO from Chromebooks to Azure AD. Off Hours Device Profiles - A First Look. Print Options with Google and Chromebooks. InTune for Chromebook Admins (p1). Is your schools IT about to fall off a cliff? Could Google Cloud Platform deliver desktops to schools? Why are you still driving a clunker ? The Serverless School.. Simple theme. Powered by Blogger.